Have you been giving your product away for free and now want to charge for it? Afraid of backlash from your users? Wonder what would make your freeloaders fork over $4.99 a month without complaining about it in twitter? I have been recommending businesses to focus on the reference price. 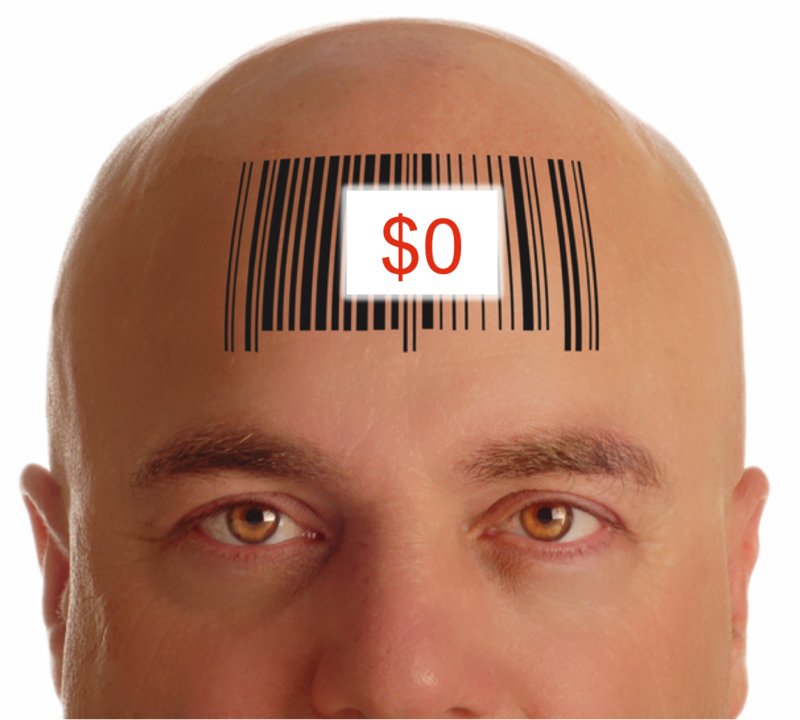 That is the price customers have been trained to pay and expect to pay for a product. Any increase from that reference price will be perceived as a pain by the customer and any decrease as a deal. The reference price problem is severe when the price is frozen at $0, that is you have been giving away your product for free. Changing the price of a pint of ice-cream from $2.99 to $3.49 is difficult but not as difficult as charging $2.99 per week for access to your free online content. The latter is several orders of magnitude more difficult than the former. Reference price solution alone does not address the free to fee problem says Uri Simonsohn, professor of marketing at Wharton School. According to him the second dimension is – It is the category problem. Imagine, for Thanksgiving, you go to your parents’ for dinner and after a nice dinner they say, ‘That’s going to be $10 per person’. We expect this category of products to be free like mom’s love is. If we come to expect a product to be in “forever free” category then reference price is not going to cut it. Moving from free to fee for this category is like charging for mom’s love. Yes – product positioning shift combined with reference price. Think of your product as something your customers hire to fill a need. You have an active role to play in telling your customers what job you want them to hire your product for. That is product positioning. When users have come to perceive your product in the forever free category you have a positioning problem. Somehow you have lost control of positioning and let them decide what job they want to hire your product for. The way to shift that is to change the job – telling your customers what new job you want your product to be hired for. That is serving new jobs of customers (should we call them customers if they are not paying?) you already have. 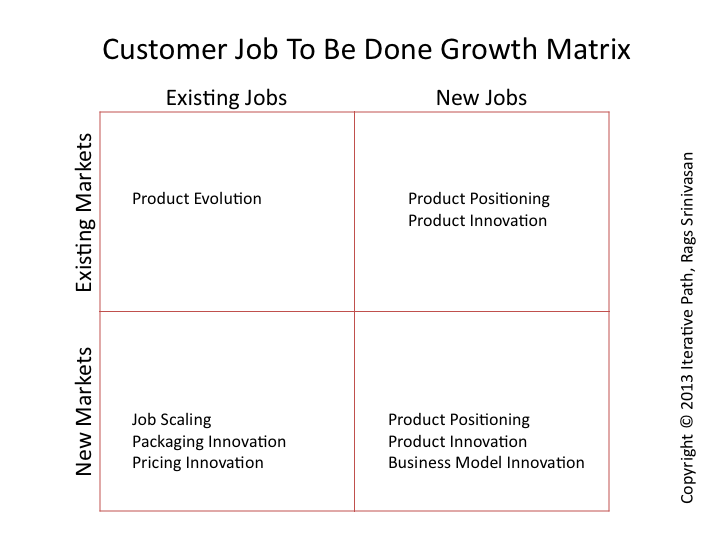 This may require minor product changes – pivots- but the key is your deliberate action to take complete control of product positioning and telling customers which new jobs your products will serve. Hopefully you will choose new jobs that they are used to paying for and not yet another mom’s love type jobs. In my last article about the German supermarket sausage pricing I asked you to conduct a thought experiment — If you were to charge different prices for men’s and women’s toilets how would you implement it such that it won’t cause customer backlash (labeled as bad price discrimination or worse gender discrimination) and helps you maximize profits (effective pricing)? Let us do the thought experiment (keep that in mind for the rest of the article and do not see this as my position on this). Price Discrimination is using multiple levers to charge different prices for different customers to ensure those who can pay higher prices will do and hence maximize your profit. Good Price Discrimination is where customers have choice and control and are not forced to act on marketer’s will. Good Price Discrimination is something that is not seen. No one notices that marketer is trying to maximize their profit and willingly pay higher prices. Like you choosing 13″ MacBook Air with 256GB. Effective Price Discrimination is where those who can pay higher prices do so and are not tempted by your lower priced options and the profit is more than what you would have had without price discrimination. Net result is capturing additional profit from your customers that they willingly give up. 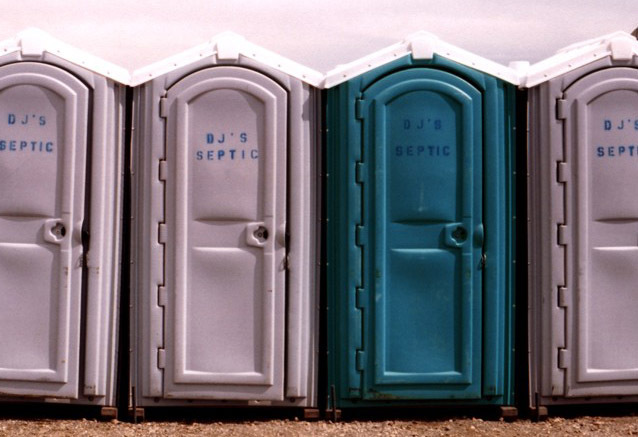 What about pricing men’s and women’s toilets differently? The next obvious hurdle is the question of customer choice and control. You cannot charge different prices for the two different toilets if they are separated in usage by respective genders. That means designing products that are separated by the values they offer and not based on customer gender. A higher priced premium toilet and lower priced basic one. As long as you provide basic features like privacy and safety (may be make it single person stall with protection), that makes it as good Price Discrimination. Step 1 is like removing roofs from third class train cars. May be you could brand the basic version with such revolting name that men will pick it but women won’t. May be you can remove a feature that is not essential but women will find important. Step 2 is hard. I will once again recommend branding lever here, choosing a brand that will turn-off men (most at least) and offer lot more features that appeal to women. You should also highlight these features (and only these features) so the customer making the choice either sees full-value or no value from this option for the price they pay. For good measure, to address the reference price issue, you should also add a really bad free version as well. There you have it. Good and Effective Price Discrimination for toilets. Whether or not that is the business you should be in and make the necessary investments to go through with branding, product design, messaging etc., is up to your economics. It is usually a bad sign when a brand uses words like, “the pricing is justified”, let alone comparing against market leader with established track record in the category. Last time we heard the price tag justification it was from then Motorola executive on Xoom pricing. We know how it ended (agreed, one data point does make evidence). If you are going to justify your price tag the best path is to use cost arguments, signaling to customers that you were doing it only because of your hardship and appealing to their “good will”. Classic example is Starbucks. While you set the prices based on customer value (and definitely not on costs) you do not communicate so explicitly to your customers. This is how head to head comparison of MacBook Air and Chrome look like (after upgrading MacBook Air to 8GB RAM). 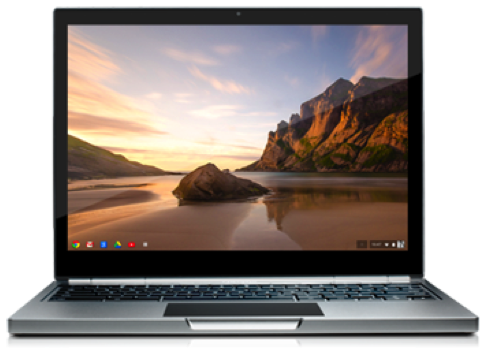 Let us assume, for now, that indeed Chrome Pixel is packed with features, compares favorably against MacBook Air. But does that mean Google can set the price point to match value delivered (or perceived)? No. 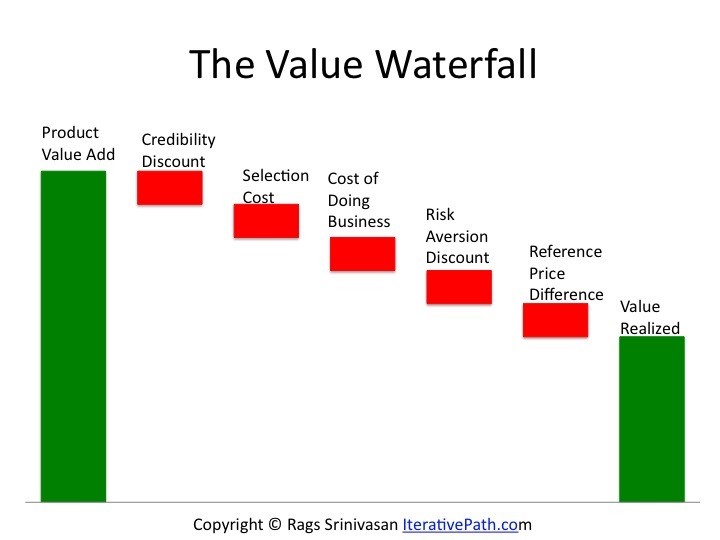 The reason is the Value Waterfall. Credibility Discount: It is from a brand that isn’t known for making premium hardware. Nor is the Chrome operating system as mature, full-featured or have supporting App ecosystem as Apple’s OS X. Selection Cost: Customers are told the additional value comes from touch screen feature (which may not be relevant to them) and from the extra 1 TB of Google Drive storage for 3 years. This isn’t as obvious to customers who have to do the math to see value of 1TB of Google Drive. Cost of Doing Business: Operating System, Apps, buying experience, support, user experience – everything comes into play here knocking down value delivered. Risk Aversion Discount: This isn’t the first attempt by Google in making hardware but there isn’t much track record for customers to see. For all practical purposes this is version 1.0 from an upstart laptop maker who does not have integrated hardware-software design. Reference Price Difference: While Google wants the reference price to be that of MacBook Air, customers will most likely use previous Google Chrome models sold at $299 and tablets with same storage ($499 for Nexus 10). Despite the additional features and the value Google would want customers to focus on, customers will see the price jump from $299 Chrome to $1,299 Chrome Pixel an unpalatable (and even unjustified) price increase. Pichai and I argued a bit about the pricing strategy: my belief is that they need to sell a lot more devices so the price has to be much much lower. Pichai argues that one needs to be able to open our mind to the possibilities of a cloud-based machine. He said that one shouldn’t look at the 32 GB of storage, but instead focus on the terabyte of storage space that comes as part of Google Drive. Google is not only trying to justify its pricing but also its measly 32GB storage by signaling value from its 1TB cloud storage. But the Google Drive cloud storage comes for only three years and costs $50 a month. On the surface it would appear the 1TB space is good value – if you were to get it separately it costs you would pay $50 a month and hence a value of $1,800. But that depends on a customer segment that values cloud storage over additional flash storage on their laptop. Besides after that three years it is going to cost customers $50 a month because with all their data on Google Drive there will be significant switching costs. This goes back to the value leaks I discussed above. If true then they should have controlled the messaging channel and the messaging to communicate the pricing and value proposition to just that segment with proper product positioning. 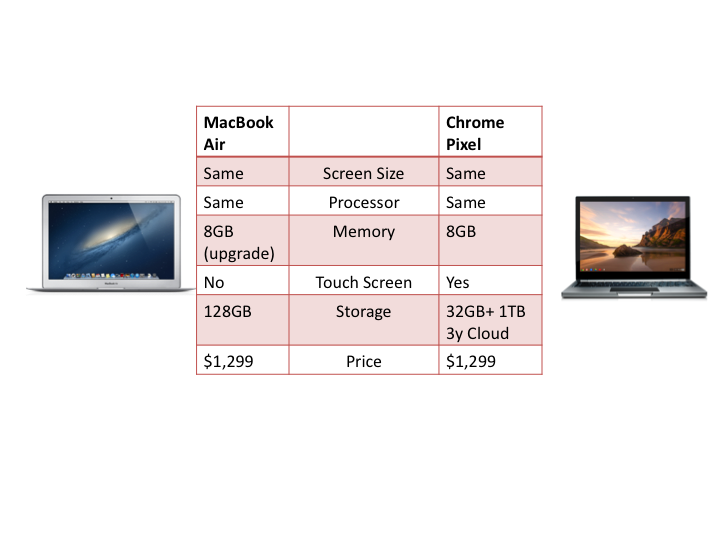 They are not clear in their product positioning to that segment – they are positioning Chrome Pixel against MacBook Air, asking customers to hire Pixel for the same job customers hire MacBook Air for and for the same price. That contradicts their segment definition of “committed to living in the cloud”, because that segment may be hiring different cheaper alternatives and not $1,299 MacBook Air. Furthermore even if such a segment exists, their willingness to pay will probably go down when they see the media reports on Google getting its pricing wrong. At this point it is safe to drop likelihoods and probabilities and go on record to say, “Google got its segmentation, targeting, positioning, product and pricing wrong”, with its Chrome Pixel. went through a mess of salons to get some price ideas for mens haircut and I am sorry, I’ve been paying 10-15 dollars for a haircut for 22 years. I cannot and will not pay $80. That’s the price of a new video game! I called the salon and I got a price of $16 for mens! $1 more than my maximum? What do we see here? An illustration of the fact that, as customers we do not walk around with a price we are willing to pay for every product and service. To a large extent this number is shaped by experience and what we have seen and trained to pay. That becomes our reference price. Any price above the reference price – like the $16 vs. $15 – is seen as a pain or price increase that need to be reconciled. And you can see how this reviewer felt after paying $1 over his old reference price. I can truly say with a tremendous amount of confidence. I have found my PERMANENT salon. Back to Willingness to Pay – the $80 price limit this reviewer quotes is his absolute reservation price. No amount of benefits, features, brand, customer service etc. can move this user to pay $80 for a haircut. His willingness to pay is somewhere close (tad below ) that number. You should know that this is just one customer and may be there are lot of them like him while there are many others who are more than willing to pay hundreds of dollars for a haircut (or the salon). What do these two parameters mean to you as a marketer or entrepreneur? Because customers do not know. Second do not be afraid of raising prices, as long as you understand the effect of reference price and execute this change correctly. Finally, if your product used to be free and you are considering pay model do not assume no one will be willing to pay that price. You need to find those who value it enough, target them and move their reference price sufficiently to get the price that is fair share of your value add. How do you manage your pricing? See also: Multi-version pricing at salons. What job is a customer hiring luxury candles for? I grew up in a country where long power outages – planned and unplanned – were the norm. If you had a test or a project report due the next day you worked through the outage with candles. The job I was hiring candles for is clear – those white long sticks that drip (leach?) were life savors for students. Without electricity, with a major test next day there is no question the candles did add considerable economic value. But those candles were priced just a few cents for a dozen. I can explain that away with at least three reasons. One there was a supply glut, two we bought the candles well before the emergency and three there were alternatives, kerosene lamps. Nevertheless it is highly unlikely any segment would pay a price that matches the value and definitely not $65-$500 for a purely utilitarian job. Let us now turn our attention to the case of luxury candles, a story featured in The Wall Street Journal. So what makes the customer pay $65-$500 and how can the players get to keep their price premium? This case study serves to showcase some of the proven pricing principles and pricing mistakes. 1. What job is the customer hiring the luxury candles for? “It’s not to say that a more expensive fragrance makes for a better scent experience, but it makes for a great story” – says a marketing VP for a candle maker. It is clear by now the jobs are no where near utilitarian and even the mildly utilitarian aspect like fragrance is not the primary job here. When marketers are able to segment the customers and position the product for a job like vacation alternative, experience, image etc they are able to charge a price for that premium value. The job customer is hiring for affects the price they are willing to pay for it. The price premium candle makers charge comes from their investment in building their brands. Not every brand can expect to charge such prices without brand development. A well known luxury brand not only convinces the buyer (hedonistic consumption) but also others they are trying to impress (conspicuous consumption). What is left unsaid here is how their overall marketing strategy works – knowing their target segment, the jobs they want to position the candles for, their buying behavior and delivering them a product at a price they are willing to pay. Simply copying the higher price without the strategy is like Mototola setting its tablet prices by copying iPad. Go for the wallet share and employ effective positioning to create emotional want when no real need exist. Notice also that they do not give bundling discount for three candles. (See here how to price bundles). There is no reason to give bundling discount when the customers are not looking for one. Besides there is a risk that the bundling discount can erode brand value. Wax and fragrance have to be compatible and correctly blended, or the perfume oils will “leach” unattractively at the sides, says Karen Solari, vice president of marketing at Symrise. The brands are effectively using their cost and complexity of manufacturing to justify their prices. But more likely they are giving customers utilitarian reasons they can use to rationalize their splurge (irrational purchase? ), assuage guilt and tell a story to others. Los Angeles “luxury lifestyle” store sells a $6,400 black patent-leather wingback chair and $575 sets of Antique French Washed linens, has a collection of 10 candles priced at $85 each. The candles, are a strategic offering in the store, Ms. Tobin says. They allow customers to “buy into the brand” with a less expensive product. For those who are willing to spend $6,400 on leather chair, $85 on a candle is likely a trivial add-on purchase (Relative price). For those who visit the store just for the experience, the $85 candle is positioned as “affordable” luxury they can buy into. Either way the store comes out ahead. Overall great example of effective pricing. How do you set your pricing? I take it you start with customers and not decide to simply copy this pricing by candle makers.